Having a clean house is something that I have always tried to have. Let’s be honest though. It’s not always easy between work and kids, a clean house is usually one of the last things on someone’s list. We needed a solution though, which is why I put together these clean house tips and tricks. This is a sponsored post on behalf of Shark. All opinions are my own though. Isn’t it funny how as a mom your priorities change? You go from knowing the latest styles and shopping with a coffee in hand to just wishing you had five minutes to yourself to sit and drink a cup of coffee without the constant cry of “MOM!” It’s as if no one else in the world can figure out what our kids need, but us. Even when my husband is sitting playing a board game with them, somehow they still need my help. Since we are clearly on call 24/7, we need to find a way to get a clean house that not only saves us time, but also a little bit of energy. I cannot emphasize enough how having a clean house is affected by the right tools. You’re probably asking yourself, what are the right tools though. There are so many conflicting stories about how harmful certain chemicals can be for your home. Before having kids I never really bothered to worry about the chemicals that were in my cleaning products that I used to clean house. Once I had my girls though it became a whole other story. I didn’t want to clean my dining room table with a cleaner that had harsh chemicals that my girls were likely to play on and eat off of. I wanted a natural solution, which is why I turned to essential oils. Now all essential oils are not created equally and we love our Young Living Essential Oils. I use Young Living Essential Oils in my diy cleaning solutions combined with other mild products that are sure to get the house clean. We have bought vacuums in the past that we’ve spent a boatload of money on, but they never seemed to get the job done right. Now that we have Charlie, our Australian Shepherd, that sheds and bring all sorts of leaves and dirt into the house, we had to find the right tool for getting the vacuuming done. My biggest complaint about our last vacuum was that it was so heavy. It was practically impossible for me to vacuum upstairs because I could just barely get it up the stairs by myself. Plus, it was bulky so it didn’t maneuver into small spaces well at all. I also felt like I was ramming the vacuum into the furniture rather than actually vacuuming. It was just too much work and time to get the right tool for our house and life, which includes a flight of stairs and a shedding dog. We love our Shark ION Flex! It is cordless, flexible and works on multiple surfaces. Even Avery gets in on the vacuuming because it is so easy to maneuver. She can even pick it up and carry it from room to room. Unfortunately, this leaves me without any excuses as to why I can’t vacuum the upstairs anymore. Now when I said earlier that our Australian Shepherd, Charlie, sheds I wasn’t kidding. Plus he has a knack of getting every dead leaf he can possibly find in our yard stuck to his fur so that when he comes into the house he leaves a leaf trail from the door to where ever he decides to take a nap. We used to vacuum daily and then sweep two to three times a day. Luckily, the Shark ION Robot solved that problem. This little guy is a lifesaver and so easy to use. Charlie was definitely wary of the Shark ION Robot in the beginning, but he quickly got over it once he realized that he was ending up with a clean house. Or at least that’s what I tell myself. He very could have just gotten used to it flying around the house vacuuming it as it goes. The robot is fabulous because he simply push the clean button and it takes off. 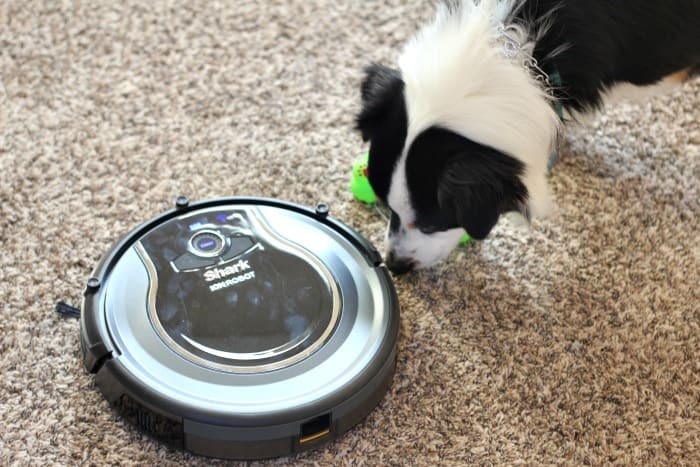 It uses sensors to maneuver around the house. When you feel that it has done an adequate job, you just hit the dock button and it’s on it’s way back to it’s charging station to get prepped for it’s next round of creating a clean house for you. Best thing EVER! I know that there are people that feel the compulsion to clean the second that they see clutter. I actually happen to live with one of those people. My husband can be a bit OCD when it comes to having a clean house. Our schedules don’t always allow for the house to be perfect, but I know that it bothers him when it’s a mess. So, in order to get a clean house that is up to his standards of clutter free, I had to change my mindset a bit. I like to get in a cleaning mode, rather than clean sporadically. I find that I need to be in a certain frame of mind to get the house clean. I throw on music and I set aside time to get it done. I think when you can set aside twenty minutes for creating a clean house each day is more likely to not be in need of a deep clean. These are great tips, Jenny. 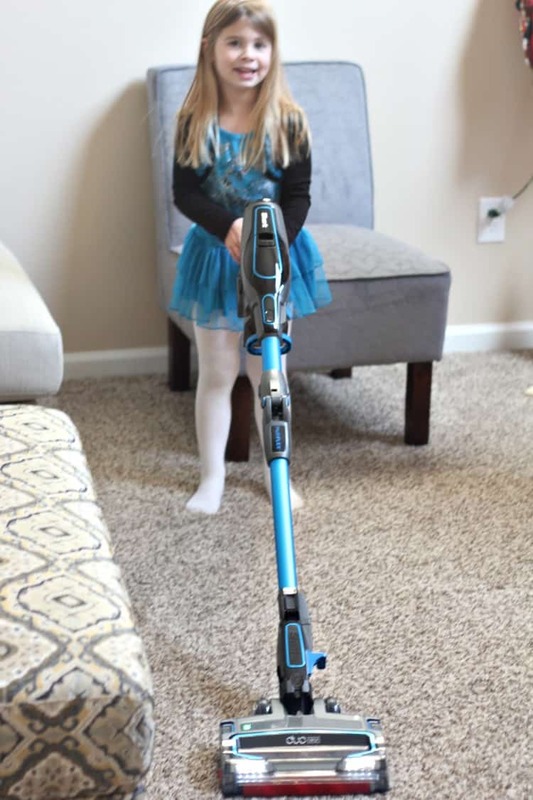 I love my Shark vacuum and the way it keeps my vinyl floors and area rug clean, not to mention the dreaded place we all hate to look under the sofa cushions. You never know what you will there. Yikes!